CarPro Tar X is an affective tar and adhesives remover from car paint surfaces. Tar X is a super strength tar remover powerful as its derived from 100% from the solvents that are extracted from orange peel. Tar X is recommended to be used for all purpose degreasing, tar and insect removal, tire marks, adhesives spot removal, traffic film and many other tough cleaning jobs. 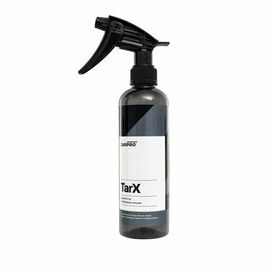 Tar X will quickly penetrate and loosens tar, so it may be flushed off with a pressure washer.